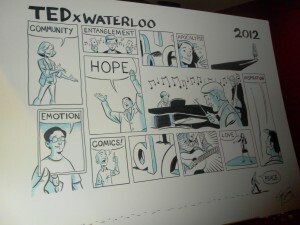 On Wednesday, I went to TEDx Waterloo. I applied this year thinking I’d either not be accepted or not be able to go due to needing to take care of Wesley, but I was accepted and a friend of mine was able to watch Wesley during the day, which was awesome. If you don’t know what TED is (how could you not! ), it stands for “Technology, Entertainment, Design” and has become a format for conferences that are held around the world. Talks are on a huge variety of subjects- speakers are charged with giving the talk of their lives in 18 minutes or less. You can see a ton of examples at TED.com. I got to the Centre in the Square just before the first round of speakers started. I particularly enjoyed Scott Chantler and Krister Chalm of the first set of speakers. 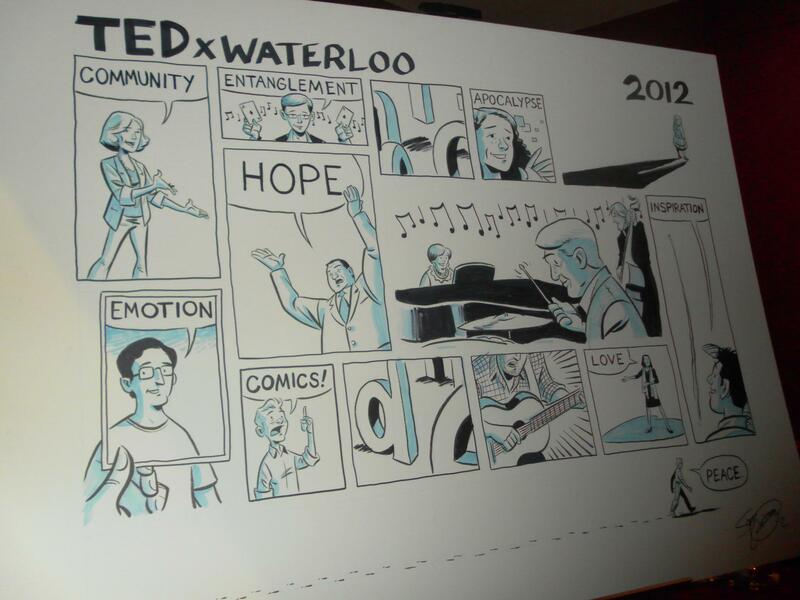 One of the really cool things about the day was Mr. Chantler’s project- he spent the day working on a representation of the day and the speakers in comic form. I also enjoyed Taylor Jones of Dear Photograph, from the second set of speakers, and Jean Béliveau, whose story of his walk around the world was super compelling. My favourite speaker of the day was Karen Morris, who gave a really well done talk about love, connection, and innovation, which is hard to describe but it really spoke to me. Overall, it was a great day. If there’s a TED in your area and you haven’t been, you should go! 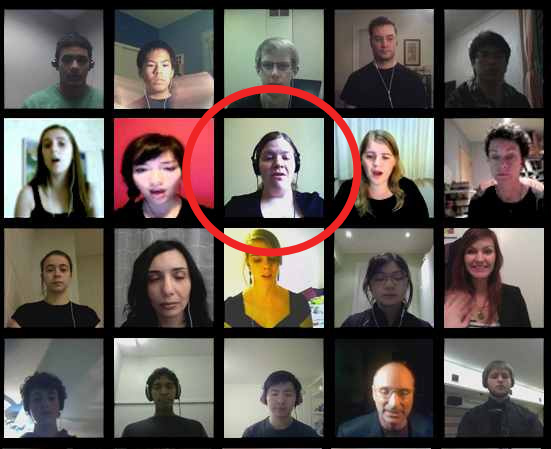 I mentioned a while back that I recorded a track for Virtual Choir 3, a project run by Eric Whitacre where huge numbers of people record tracks of themselves singing a part of one of his choral pieces, and they’re all mixed together to make this huge choral recording. It’s awesome. Anyway, I missed out on Virtual Choirs 1 and 2, but managed to make a recording for the 3rd by the skin of my teeth (they extended the deadline and I got my recording in that day)! The actual video/recording is going to be released on April 2nd, but today they released a huge photo of all the members of the choir, and I found myself! Click on the picture to see everyone. I’m in the 4th row from the bottom, 25th from the left. 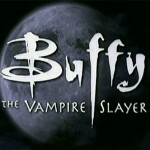 I’ve been watching Buffy the Vampire Slayer lately, and it has been pretty entertaining. 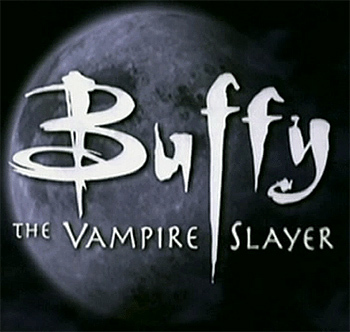 I never watched it at all when it was originally on, and since there are so many episodes, it has been a good one to watch during feedings and naps during the day in order to relax. I’m in the middle of season 3 now. It reminds me pretty strongly of a magical girl anime, only live-action and in English. This morning, a band of thunderstorms has come through and it has been all thunder and lightning! 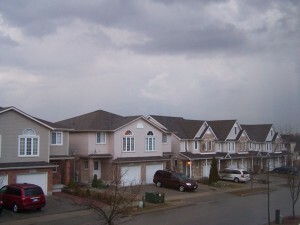 A little early, maybe, but real thunderstorms! The temperature is supposed to top 20 degrees today and for the next several days as well (20° C is sort of a big spring milestone- it’s the beginning of “seriously, no jacket” weather, haha). 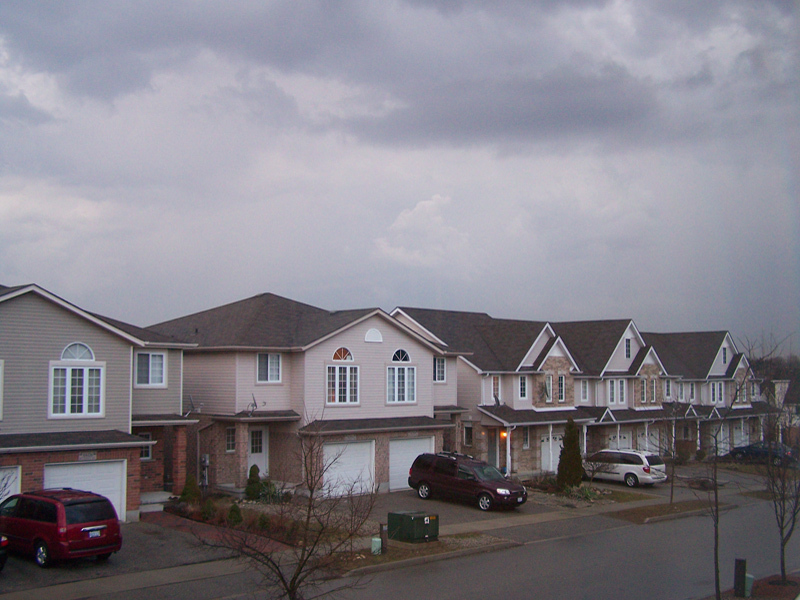 It’s starting to clear up now, but it was pretty crazy to hear the thunder and see the lightning flashes out our window this morning. http://www.jenniferreneehill.com/blog/wp-content/uploads/2016/04/jrh-logo.png 0 0 Jenny R. Hill http://www.jenniferreneehill.com/blog/wp-content/uploads/2016/04/jrh-logo.png Jenny R. Hill2012-03-15 12:09:182012-03-15 12:09:18Spring is coming! So I totally got the mom haircut. My hair has been pretty much a disaster for several months now- I’ve been scraping it into a ponytail or a bun, while wet, pretty much every day. I had a bunch of shorter hair as well, that had grown in while I was pregnant, and I wanted the length of my hair to be a little more consistent, instead of having a ton of short hair and a ton of longer hair and having it all look ridiculous. And I get why moms get the short haircut. The kid pulls your hair all the time (or spits up in it). You have zero time to do anything with it. You don’t want to do anything with it. Getting rid of the extra length solves a lot of things! So I got a haircut finally! 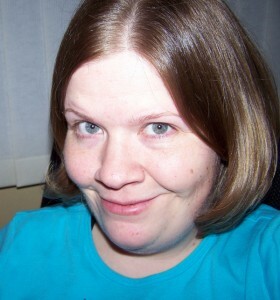 And it is a short bob, as is typical, but I don’t care, I’m just glad my hair isn’t the huge mess it was before. It’s not unusually short for me- it’s about as short as I generally go though. I got a shampoo and style and everything. It was awesome. http://www.jenniferreneehill.com/blog/wp-content/uploads/2016/04/jrh-logo.png 0 0 Jenny R. Hill http://www.jenniferreneehill.com/blog/wp-content/uploads/2016/04/jrh-logo.png Jenny R. Hill2012-03-03 12:43:052012-03-03 12:43:05I got one. Leap Day, and March comes in like a whatever. So yesterday was leap day, and I didn’t post, but I figure leap day doesn’t count. I watched 30 Rock last week and they had this whole crazy episode basically building up traditions around leap day, including having a bizarre Santa Claus-like character called “Leap Day William” who gives candy and cigarettes to crying children, haha. A clip! Anyway, the whole concept behind the show was that leap day was a day that didn’t count in your real life, so you should do something crazy! I did not. However, the day itself was a little crazy, because around 2:15 or so in the afternoon, the power went out. The power almost never goes out here, we have underground power so bad weather doesn’t drop lines, and in general, service is pretty great. But nonetheless, yesterday, no power from about 2:15 til about 5. Our house started to get a bit chilly (especially the family room where I spend most of my time- it’s above the garage and has a huge window, so it’s not the best insulated of rooms). Wesley and I moved up to Trevor’s and my bedroom where it was warmer and hung out up there, I read my book a little. I was glad the power came on before it got full dark, but it made me think maybe we should have a proper emergency kit with bottled water and batteries and extra flashlights and all that. I will think about getting one of those put together. We have plenty of food stored up, thanks to our deep freeze and our pantry, but having a kit would be good, especially having a baby in the house. You know. Just in case the world ends. Does anyone have one of these? If so, what’s in yours? http://www.jenniferreneehill.com/blog/wp-content/uploads/2016/04/jrh-logo.png 0 0 Jenny R. Hill http://www.jenniferreneehill.com/blog/wp-content/uploads/2016/04/jrh-logo.png Jenny R. Hill2012-03-01 14:43:442012-03-01 14:43:44Leap Day, and March comes in like a whatever.